Parents — the most influential people in a students’ life — are too often the least well-informed about the need to partner with their schools in a productive way. Life itself is a risk-taking adventure and with young children and adolescents, it is even more so. How many times have you heard of “good parents” who lost their child to drug addiction or the ultimate of losses, suicide? No one is totally immune. The best we can do is reduce the risks as much as possible, in every way possible. And for that, we do need partners. Schools continue to be an institution whose role in many students’ lives is second only to their parents, if they are lucky enough to be in a “good” school. Good or bad, have we done all we can to foster partnerships with schools? Are we even consistently informing parents as to what their constantly changing role in education is? Clearly understanding our roles and responsibilities for every “stage” of our children’s education is a good first step but only if the information is correct. Too often parents are told that teenagers don’t want them “involved.” Not true. Involvement in their lives will take on different forms, yes, and partnerships are especially helpful in staying involved albeit at a bit more of a distance. And this is where the larger community comes into play. Parents must of course fulfill their responsibility to their own children first; but can we not also help others learn to help themselves and in that process break the generational ignorance plaguing our country while building community support for all our youth? It isn’t government that is needed to accomplish this; it is people building a sense of community. At a time when society desperately needs to foster well-educated, well-informed citizens, we all need to look at what we can do to create the conditions for partnerships to develop and grow. Little acts can have a big impact. We won’t improve education without educating each other. When you read or hear something that you believe is valuable, find a place to share it; it will surely have value for others. If your school administrators are not receptive to your views, refuse to allow those barriers to stand in your way. Find another way to be heard. It is after all your vigilance and your willingness to act that is the “imperative first step” in the improvement of YOUR schools. The principles of partnership building are nothing new or excessively complicated. Partnerships develop as people begin to understand their common concerns. Conversations about what we see as important foster respect for each other’s opinions and allow a forum for expression of our expectations — of each other. It’s not a one way street. It takes personal relationships to form partnerships. Invest your time where it is most important and will have the best chance of being effective — decrease risks by building partnerships in your child’s school and community. Victoria M. Young is an Idaho veterinarian, parent, long-time classroom volunteer, and served on committees addressing safe schools, science education, strategic planning, and policy writing. 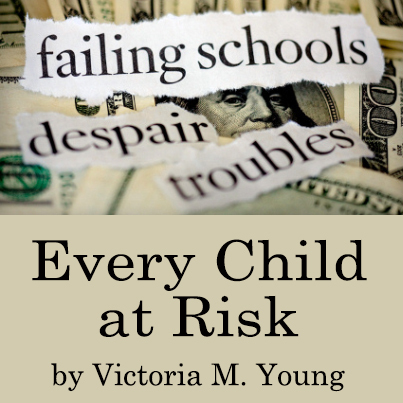 Committed to using what she learned to help improve America’s public schools, she authored Education’s Missing Ingredient: What Parents Can Tell Educators in 2009 and its second edition, The Crucial Voice of the People, Past and Present in 2012. Federal Education Law: Is It Unconstitutional? Is Common Core a Tool or Weapon?